For a team that is ranked second in the world, there are a lot of questions been asked about Belgium. If you look at their squad in great detail you will see that they have an amazing amount of talented players. I myself have been very critical of the Belgians as a team over the past couple of months. I have pointed out that manager Mark Wilmots may have superstars, but he has failed to galvanise them as a team. When you take into consideration the fact that Belgium have not won anything and were very poor in the 2014 World Cup, you have to wonder as to how the bookmakers can have them as one of the favourites for the competition. It amused me even more, when they lost their opening game against Italy, they not only lost the match but they never produced anything on the day. So going into the game against Ireland, they were under huge pressure. Also if reports were to be believed, there was a lot of rows going on between some players and the coaching staff. This news must have been like sweet music to the ears of the Irish players, as we all know the Irish team are a very solid bunch and you very rarely hear of any unrest. So how did it all unfold on the day? The whole game developed in a way that I and thousands of Irish fans could not have imagined. Football can be so cruel at times. Going into the game Martin O’Neill knew he would be without the injured Jon Walters. I like many others were watching to see how O’Neill would change things. I expected James McClean to come in for Walters and when it was announced that Stephen Ward would start, I knew there was trouble ahead. It gave me an insight as to how the manager was thinking and without a doubt he was sending his team out to try and get a draw in my opinion. I do not want people to think I have a problem with Stephen Ward as he will always put in a good shift and is very good defensively, but when it comes to getting forward James McClean was the better option. It was the day that Belgium finally turned up and to be perfectly honest, looked an excellent side. Once they scored their first goal through Lukaku, there was no way back for the boys in green and it only highlighted what this Irish team lacks. At one nil down it was always going to be an uphill struggle and O’Neills team had no one who could get hold of the ball and just take the sting out of it. I do not like to critisize a manager who has done wonders with this group of players, but on Saturday he got his tactics totally wrong. Pumping the ball up to Shane Long all the time and hoping for something to break was ridiculous, in fact sometimes the ball was coming to Long up around his neck. If Shane was not getting the ball it was coming straight back at the Irish defence and they never got a breather for the whole of the second half. Witsel effectively finished the game in the sixtieth minute, he came between defenders and finished with a powerful header. Now this is where it got very annoying for a lot of the Irish fans, myself included. Just after the second goal the Irish manager decided to bring on James McClean, far, far to late in my opinion. James should have been on after Ireland went one down, to give the team a chance to at least get back in the game. 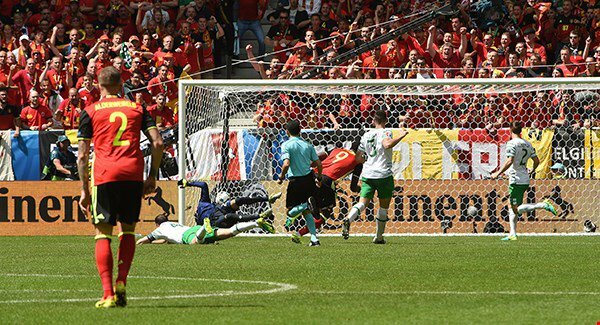 The Belgium third goal just rubbed salt into the Irish wounds. This defeat was the worst since Martin O’Neiil took over and I know a lot of the players were hurting in the dressing room after the game. The defeat was bad enough, but the three goals has now given the Irish an awful goal difference, something that might come back to hurt them in a couple of days. Next up for the Irish is a game against Italy, who have already qualified for the knockout stage. It is an Italian side that has surprised a lot of people and as per usual they have shown when it comes to tournament football, they are always prepared. I really am struggling to put forward any argument that the Irish can beat Italy on Wednesday night. The talk in certain sections of the media is that Italian manager Conte will field a weakened team as they have already qualified. No matter what team Conte puts out he will have them well prepared and organised. On Wednesday night the Irish team need to up their game, run themselves into the ground and if things go right, maybe, just maybe they will get a positive result. The Irish fans in France have had a fantastic time and have been a credit to there country. If the football gods want to repay them for their behaviour, they could give them the result that will give them at least one more game in the tournament. If it all goes wrong, the fans like the team will be heading home and the party in France will be over. Ince set for the Swans?